Continuing the list of tools and supplies you’ll need to make a good looking prototype! Cubes: If you go to a school supply store you should be able to buy a tub of 1cm multi-coloured plastic cubes. This will cost you around $25-$30 and will be your supply of pieces for over a dozen games. These cubes can be used as character markers, resources or money. I also found some 2 cm wooden cubes that came in many colours at a dollar store. Having cubes in two different sizes has helped in numerous games! Poker Chips: Poker chips (the cheaper small ones) make for great money in a game, and they usually come in different colours too. 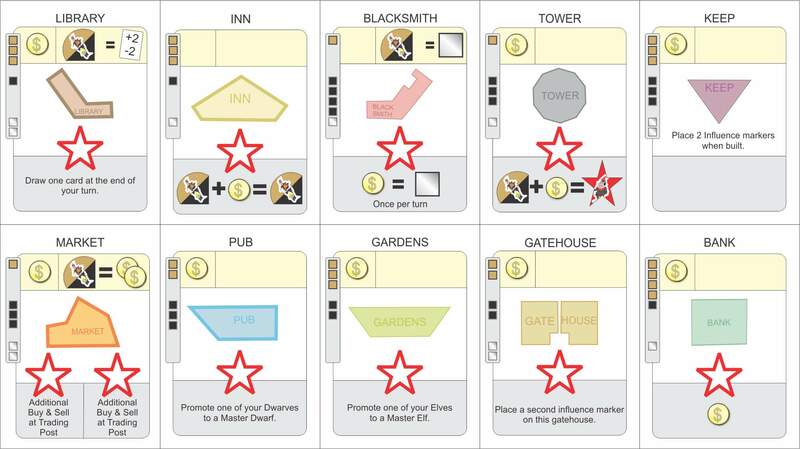 You could use cubes if you don’t need cubes for other things, but if we are using cubes to indicate player markers, then it would be confusing to players if cubes were also used for money – even if they were different colours. Pawns: Pawns seem to be the hardest thing to come by. 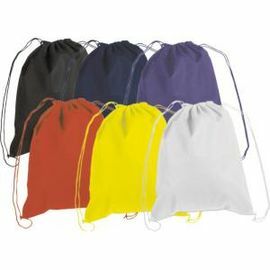 Sure there are plenty of places online to buy them, and I really should dive in and buy a bunch in different colours, but they’re hard to find in stores. It should be pretty obvious that pawns are needed in a lot of games. Again you could use cubes (and sometimes we do), but if cubes are already representing something else, then pawns are needed. Stones: Not mandatory at all, but we have found that using these pretty gem stones add some class to a prototype. Usually we end up just using cubes, but for Rune Masters the stones seemed to make more sense for one component that we called Rune Stones (why would we use cubes for that!?). Misc pieces: For our 5th or 6th prototype for Santorini we changed how resources were being shipped and resources had to be placed directly onto ships instead of ‘jumping’ from one island to another. Up until then our ships were just pawns, so we had to make some ships which we did out of gluing some popsicle sticks together. It was serendipitous that popsicle sticks are also 1cm wide as that allowed us to even create side ridges on our ships so that the 1cm resource cubes could snugly fit in the ships – very cool! Corner Rounder: We had a couple games where we thought the professional looking rounded edges of some of the components would take it over the top. It did make some of the prototypes look pretty sweet, but we just didn’t end up using it that much to make it worthwhile. Die Cutter: We had one game that we needed to make a bunch of similarly shaped tags out of plastic and cutting them by hand seemed ridiculous, so we got a die cutter. Yeah, not so great a purchase! It was fine for that one game, but we never used it again. Once the game is nearing its final stages of life and is ready to be shown to a publisher, then it’s time to make an amazing prototype! For now it’s important to understand that you will probably still make 5-20 more prototypes of each game before sending it to a Publisher, so no need to spend too much time. So how far is too far? Well, I met one game designer who had a party game designed. The prototyped looked amazing as each of the cards had a printed front and back to them – and they were all professionally laminated. I was impressed for sure. We played the game and gave our feedback and the next time I saw him he had his game again – but this time with a whole new prototype. All the cards were brand new – but they looked as professional as they did before. I saw him two more times and both times he had another brand new professionally made prototype. He must have spent a lot of money getting these prototypes made. I asked him why he spends so much money on getting them made and his answer was that he always thought that the next prototype was going to be the last prototype. While we all hope that will be the case for each of us, experience tells me (and hopefully that guy by now!) that there is almost always going to be one more prototype to be made! For our first game we ever made, Top Shelf, Sen and I spent a lot of time making an amazing looking prototype! We made the board and affixed it to cardboard so that it folded like a real board! Then we affixed each tile to matte board and even affixed a backing to each tile so that it had the logo for the game on the back! Then we even ‘sanded’ down the edges of the tiles so they … hmmm…not sure why we did that! They looked cooler though! It was too much of course and when we had to make our next prototype of that game it was much simpler. If anyone has links to share of part/bit suppliers, please share! I’ll look through mine and post later. I would say another essential bit of gear is a good “bit box” – something to store all your cubes, dice, etc. in an organized, sorted fashion. Jay and I both use things that were probably intended for hardware (nails and screws, etc.) Mine has a handle and 4 trays that pull out, each with customizable sections. I use them to put everything in one neat cube of game design bits. 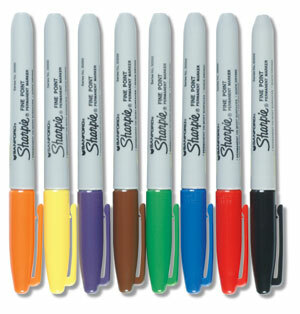 We use Sharpies a lot. Also wood stain markers, acrylic paints, spray primer, pencil crayons, etc. Other “must have” drawing tools include a good metal rule, erasers, pencil sharpeners. Some tools we have used on the rare occasion include number and letter stencils or stamps for use on plastic or wooden bits that we can’t print on. Not everything can be loaded in Tray 1 of the laser printer! Stick glue and spray adhesives are used a lot to make the final prototype. I use that bluetack stuff to cobble pieces together from time to time, to hold tiles to map boards more permanently, etc. Self-explanatory – we have a plethora of polyhedra dice at our disposal. Like any good game geeks should. Jay and I don’t use a ton of dice, by nature (Jay has diceaphobia, or maybe he’s a dicist, I’m not sure), but it helps to have some methods of randomly generating numbers around! Helpful for storage as well as randomizing tiles or cubes and keeping them hidden from view. Great for games like “Santorini” to keep resource cubes random or for “Scene of the Crime” to keep the clue tiles hidden from view. I have a Dremel that I use to cut, grind, and rout wood blocks, mostly – I also have a coping saw for cutting small metal rods/tubes or harder woods and plastics. Both were invaluable for creating “Junkyard”. Some components are very dependent on the game you’re making – like magnets, push pin flags, etc, – but, like Jay said, we will often find stuff that we think is cool and just grab them in the event that they might come in handy someday! If they come in many different colours (at least the game standards like red/blue/green/yellow), it’s a pretty sure bet, I’ll purchase enough to make a set of 10 of each. The only other one that comes to mind is my sticker maker. Besides a computer, a game designer is going to need a few more tools to help make everything easier. This post got too big so I separated it into two smaller posts (but they’re both still kind of big!). 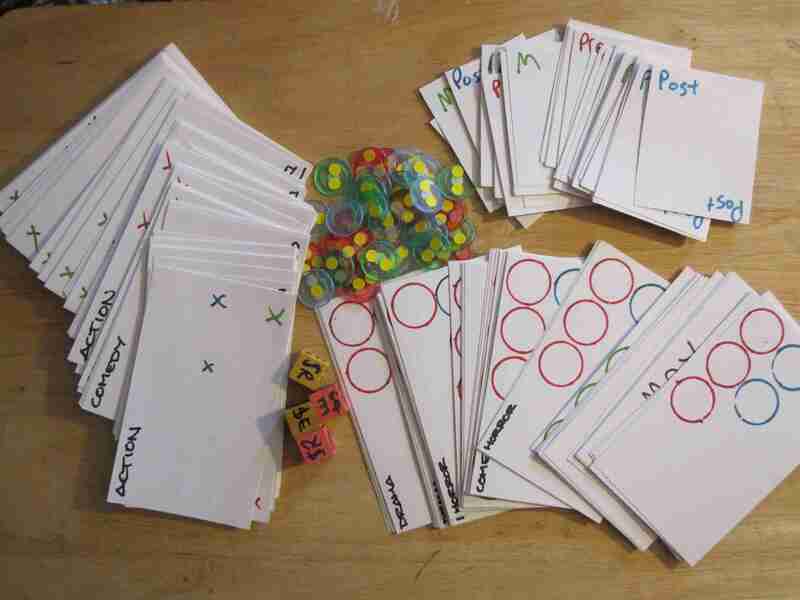 Cue Cards: Perfect for making your first prototype. They’re thick enough to ensure you can’t see too much through them. Card Boxes: Card boxes help keep our games separate and tidy. It’s not mandatory of course, but if you’re transporting your games all over the place (or even when shipping to a publisher), some sort of card box is handy. They also come in different colours which helps keep different deck distinguishable even before you open the box. Colour Laser Printer: Both Sen and I each have a colour laser printer which is pretty mandatory if you plan on designing a lot of games. Inkjets cost too much and you’re replacing cartridges too often, but lasers give great quality for clipart based printing. Cardstock: We always print on a thicker card stock as that gives the cards some weight and prevents the cards or even the board from being disrupted by a slight breeze. We also have a supply of multi-coloured cardstock as that helps distinguish between different decks of cards in the same game more easily. For our game, But Wait, There’s More, the cards are business card sized, for which there are no card sleeves. Since there isn’t much shuffling in the game, we decided to print on multi-coloured cardstock. There are 4 different types of cards and each one has a different colour, which makes them easier to sort and easier for players to identify. 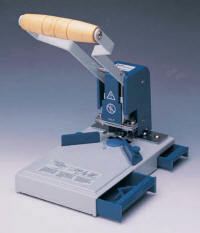 Paper Cutter: You are going to be doing a lot of printing and a lot of cutting! Get a decent paper cutter otherwise you’ll go insane cutting cards with an X-acto knife! 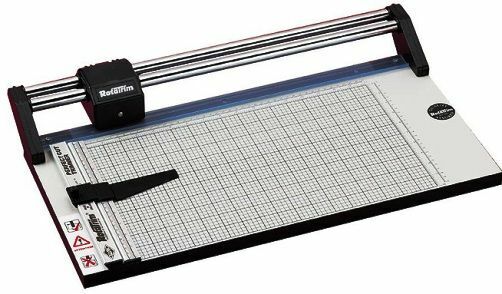 I prefer the sliding paper cutter as opposed to the old fashioned long-arm cutter as the long-arm cutter can often cause paper to be mis-aligned. X-acto knife, metal ruler and Cutting board: That said, you’re still going to need an X-acto knife, a metal ruler and a cutting board for smaller or irregular shaped pieces. We don’t use it as often as our paper cutter, but it’s still used enough to make it mandatory. Matte board: Matte board is great for making games that have small tiles in it. If you print tiles on cardstock and don’t affix it to matte board then you’re going to find that the tiles will float around on your table because they have no weight. Matte board can be purchased from any framing store and sometimes they might even give you some for free as they often have no need for the areas they cut away. The benefits of matte board are that you can get different colours in case you need tiles with different backs, it’s got a good weight without being too thick, and it can be cut by pretty much every paper cutter out there. One game we made early on called Scene of the Crime involved placing Scrabble sized tiles onto a board. We printed the page or two of tiles and spray glued these onto matte board, then cut them with a paper cutter. This made our prototype way more playable and even added to the fun factor (or at least reduced the frustration factor!). Stay tuned for the next post as it will continue the list of tools of supplies needed to make a prototype. For those of you who don’t know, matte board is the stuff used in picture frames to provide a border. My paper cutter is worse than Jay’s because it locks down before each cut – you’d think this would be a benefit, but it’s not! When you’re cutting hundreds of cards, it’s nice to go fast – we put things in the card sleeves anyway, so perfect cuts aren’t as important. The other nice thing about card sleeves is that they come in myriad colours, so you can keep your decks separated in a multi-deck game – makes for much easier sorting come game end. I’ll wait to see what else you’re going to post before I add more to the list…I wonder what other designers find essential? Before showing any game to playtesters I like to have as pretty a version of the game as possible. This is my preference and might not suit all tastes, however I do know that a more polished prototype does improve gameplay. Your playtesters will take you more serious when the prototype looks like you spent more than a half hour on it. So how nice are we talking? At this stage we’re still just talking about doing everything yourself. Don’t take anything to a printer yet! This stage will require some computer skills and while you don’t have to be an artist, you will need a good eye for layout and presentation. You’re going to need some sort of drawing program. 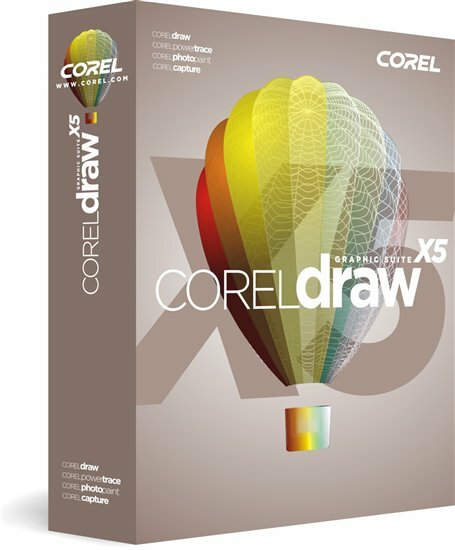 For all of our art we use a program called Corel Draw. This is a vector based drawing program which means you can resize your images without losing any resolution. Adobe Illustrator is another fine vector based program – whatever you’re comfortable with is fine. Even if you don’t have these programs you could use PowerPoint or even Word (but be prepared for a lot of frustration!). Drawing programs make it easier to line things up and duplicate your efforts easily. There is a learning curve, but if you plan on becoming a designer then you should get to know at least one drawing program. We like to add some flavour to our prototypes by adding clipart. Used poorly though and clipart can be quite ugly, but if you only use it to help tell your story and make your game easier to play, then use clipart for sure! If we need an elf or a gun or a train then we look it up in our clipart program. We like to ensure that anything that needs a symbol to help players recognize it has it. So instead of saying 3 Gold, we’d rather show an image of 3 Gold coins. These clipart packages are better than just searching online. Searching online for images you will come across two challenges. Most of the good clipart is not free. You will have to either pay for the good stuff, or use clipart with watermarks all over it. 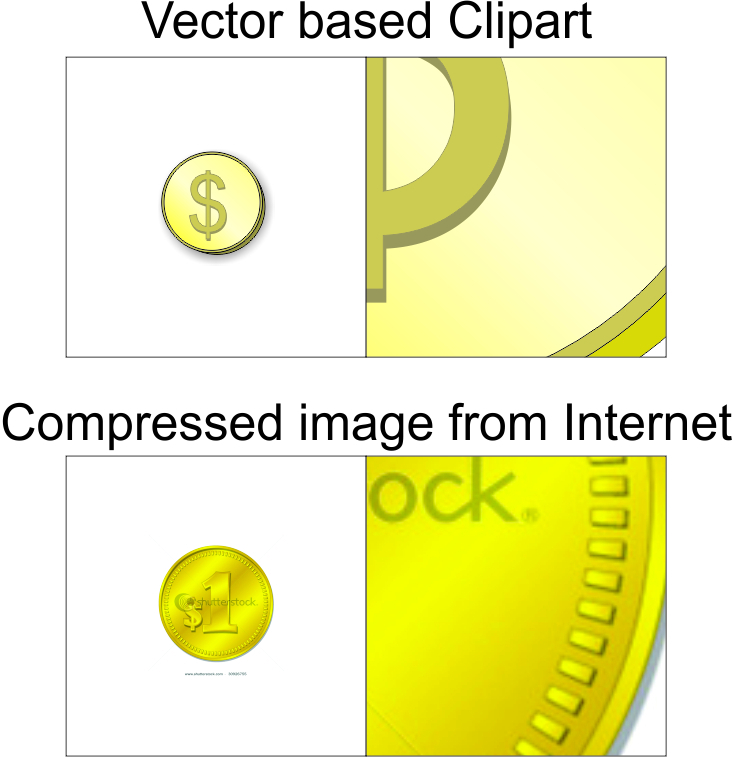 Most of the clipart you find online will not be vector based. Mostly you’ll find jpgs and gifs. The challenge with this is that you cannot resize these images very well without them getting blurry – but more importantly, you can’t alter anything about them at all. For Night of the Dragon I found a great clipart of a Dragon, but I needed it to be red as all the other colours were taken by player pieces and if it was the same colour as a player it would add too much confusion. Because it was vector based clipart I was easily able to change the colour. If I had downloaded that from online then I would be stuck with the colour it came in. Note: If you don’t have a vector based drawing program, then you’re going to have to use jpgs and other compressed images. Clipart packages can be pretty cheap now and is a very integral part of our game design process. One other tip about working with a computer for game design: when you come back to your drawing program to make some tweaks (and oh it will happen…a lot! ), I highly recommend to resave the file as a newer version (v1, v2, v3 etc…). This way if you ever need to revert back to an older version for some reason, you won’t have to waste time recreating something you already created. This has helped us a lot as we have often had to revert back some aspects of some games as we were making prototypes and playtesting. As we are finding out working with more and more graphic designers (i.e. people who know more than we do about graphics), one key to strong design is “flow of information” or, put in another way – how well is the information conveyed from the cards or board to the players? We think a lot about this when we’re doing the graphic design portion of things. For example, if you look at the cards for “Belfort”, the originals have crappy artwork, but the layout is clean and consistent – especially the costs. They were all made in a specific order so that you could easily scan down the left side of each card and compare costs, even when the cards were fanned out in your hand. A little forethought goes a long way with this, because it makes the game not only nicer to look at, but easier to play. And one of the biggest detractors in any game – for Jay and I, anyway – is downtime. Whether it be caused by “analysis paralysis” when there is too much information getting all jumbled up thus slowing down your decisions or by players having to look here and there and everywhere to get the information they need, it’s all bad. Good layout of the information on your cards, board, player aids, etc. can take seconds or even minutes off each players turn. And while that doesn’t seem like much – imagine if there are 5 players, each having 6 turns in a game… Simple math will tell you that shaving 30 seconds off each player’s turn will save you 15 minutes of total game time, which can definitely influence how quick some gaming groups are to pick up a game to play. We often make player aids with charts etc. to better consolidate information so people can compare and contrast costs, benefits all in one place. We also spend a lot of time trying to come up with clear and instantly recognizable iconography for anything that gets used consistently through a given game. Jay’s example of the Gold Piece above illustrates a very common, repetitive icon – I’m sure we’ve used that specific one in over 75% of our prototypes so far, in fact! Icons are so much quicker to scan through than text – which, even though you may be a quick reader, you still have to decode. And if there is a lot of text on a card, it takes that much longer to decode it all and distill what might be important to you this turn. If you can have it presented to you in as few icons as possible + a few choice words to impart the gist of the card, that is infinitely better than having it spelled out for your in pure text, in my opinion. While a picture can say a thousand words, solid graphic design can speak a thousand languages. With the hope for localization of our games to other countries (Germany, here we come! ), we always try to keep any high-cost components (things that would need to be die cut, etc. like decks of cards, boards, etc.) to be as text free as possible to minimize the amount of translation that needs to be done. Whenever possible, we like to use icons in place of text. SO! While your prototype doesn’t have to have Quentin Hoover level artwork on the cards (He’s one of my favourite MtG artists), well-thought out and strategically planned graphic design can help playtesters to understand and play the game faster and better. And that’s one step closer to getting a prospective publisher to accept a submission from you – the cleaner your game is from the moment they get it in their hands, the better shot you have of taking it all the way to publication. Train of Thought sent to Printers! Well today is the day that Train of Thought was sent to the printers in good ole China! I’m curious about the turnaround time on how long it takes to print, and if Tasty Minstrel gets a sample to approve, and then shipped back to the US. They are trying hard to ensure we have some in time for the convention we’re all going to in November in Dallas. Also – with its own Facebook page now, we’re looking to ramp up the reviews from anyone that has playtested this game. So if you’ve played it and enjoyed it, then please visit the Facebook page for Train of Thought and add it to the Reviews section. There are already 3 reviews posted if you’re interested in reading what other people are saying (and 2 of them aren’t related to, or friends of, either Sen or myself!). Tasty Minstrel just created a Facebook page for Train of Thought. Head on over to join in on the fun! Become friends with Train of Thought and impress your other friends…! 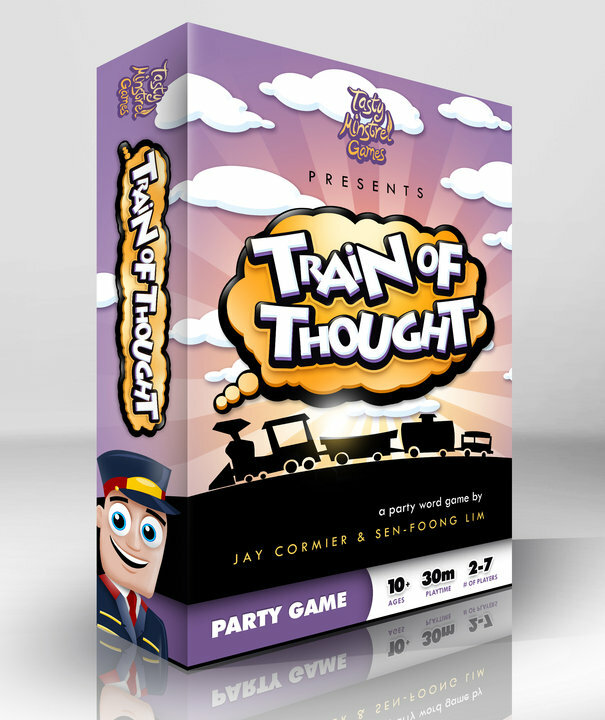 The rules for our first game that’s coming out, Train of Thought, is now available to see! Tasty Minstrel is looking for feedback on clarity, flow, design – anything basically. They are hoping to send everything to the printers on Tuesday – so we have this weekend to provide input. Please take a look and provide your 2 cents either here and I’ll forward to Tasty Minstrel, or you can provide feedback directly to TM by joining them on Facebook. Thanks for your help. You’ve got a prototype made and now it’s time to try it out. The first person you should always try a brand new game out with is yourself. If it’s a four player game then simulate all 4 players and play as each one when it’s their turn. Play as if you had no knowledge of the other players’ cards or information. This will give you a general idea if your concept is working. Sometimes you don’t need to play the entire game to understand if something’s not working. Santorini is a tile laying game we designed that involves shipping resources around islands on ships. I wanted to make a tile laying game that had different rules on how you could match tiles together. The first prototype allowed players to place tiles such that it covered up one corner of a tile already in play. After solo-playtesting it I soon realised that this would lead to a riducolous amount of Analysis Paralysis (a state where gamers spend more time analyzing what they should do rather than playing – not good!). Back to the drawing board! As mentioned in a previous post, this is why it’s good not to put too much effort in your first prototype. Through Solo-Playtesting you will almost always find something about the game you can improve. For Night of the Dragon players play cards to move their pawn in the direction they want to go – towards the mountains, desert, sea or forest. When I printed out one of the first prototypes I realised I couldn’t fit the entire board on one sheet, so I printed each of the four land type areas separately. 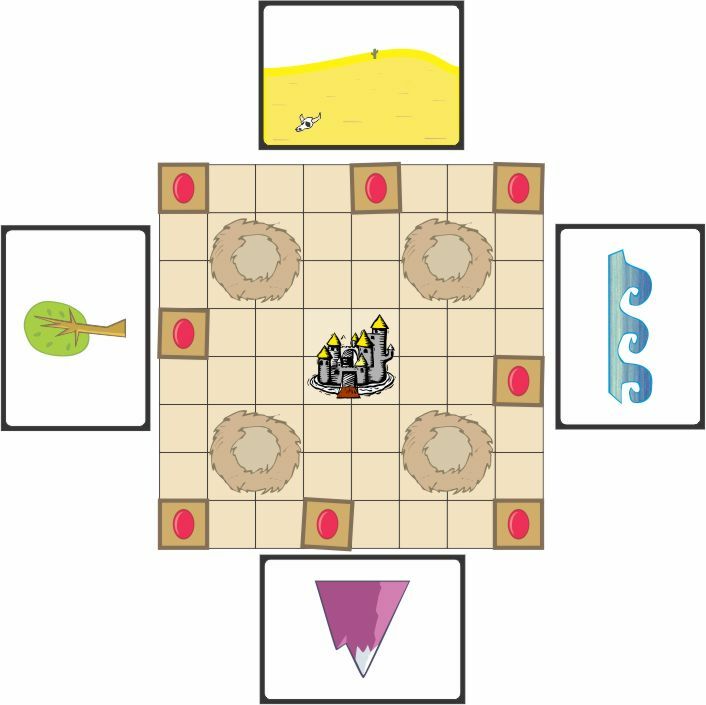 When I cut them out and laid them next to the board I realized that we could add a whole new aspect to the game where players could rotate the world and have each land type area move one spot clockwise. This ended up being a crucial aspect of the game that came from Solo-Playtesting. The good thing about having a partner in designing games is that you always have 2 playtesters! The trouble with our situation is that we’re on either side of the country, so we still rely on Solo-Playtesting before taking it to the next step. While Jay and I do a lot of the design together via the internet, we both engage in solo playtesting sometimes once a first prototype has been made – we will share the artwork and will each print and cut out a copy. Playing with yourself isn’t as silly (or explicit!) as it sounds. There are a ton of relevations you can have just by making the prototype and moving pieces around on the board. Jay’s example re: NotD is a good one because if he never made the prototype, we never would have come up with the very interesting rotating knives…I mean map…er…rotating map concept. I have to admit, though, that Jay is the king of making the prototypes and trying them out, moreso than I am. Some of it’s incompatibility of software. Some of it’s lack of time. But we always post our findings to each other via our forum and work through the issues with each other online. There is honestly, however, nothing that takes the place of actual hands-on game play to really work things though. In playing things solo, you can work out many kinks prior to you bombard your friends and relatives with the inevitable call of “Hey, I got this new game I want you to try out…”; very rarely (exception: “The Dig”) do Jay and I get anyone else to play our games without at least one of us (or both) spending a ton of time playing though many many turns of a game to see if it’ll stick. So solo playtesting is a great step to ensure that what you unleash on an unsuspecting gaming public is at least worth their time and effort to come to games night! Once we’ve got a bit of balance into our game, it’s time to make a playable prototype. How good should the quality be at this stage? As rough as possible, as long as it doesn’t negatively affect game play. 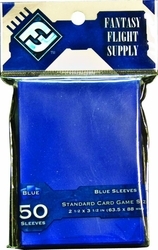 If your game has cards in it, then it’s not wise to just cut up pieces of paper to make them because you’d be able to see right through them and that possibly could affect how someone plays the game. For a first prototype it’s best to keep it simple. If you can get away with using cue cards for your cards, then do that. Don’t spend time at this stage of the game creating any artwork or even a design layout. After making so many prototypes for so many different games, there is one constant for all of them – you will make a lot of prototypes for each game! The first prototype needs to be playable enough to see if your concept works as intended. If your game has a board, don’t spend time gluing it to carboard at this stage. For now, it’s fine that your board is just paper. Tape it together if you need to, but not much more than that is needed. Here’s a first prototype for a game of ours called Box Office. You can’t get much more basic than this! Cue cards with cubes for dice and bingo chips. The concept of this game is intriguing (a game about scheduling movie release dates to maximize profits!) but we haven’t found the balance between simulation and fun yet! 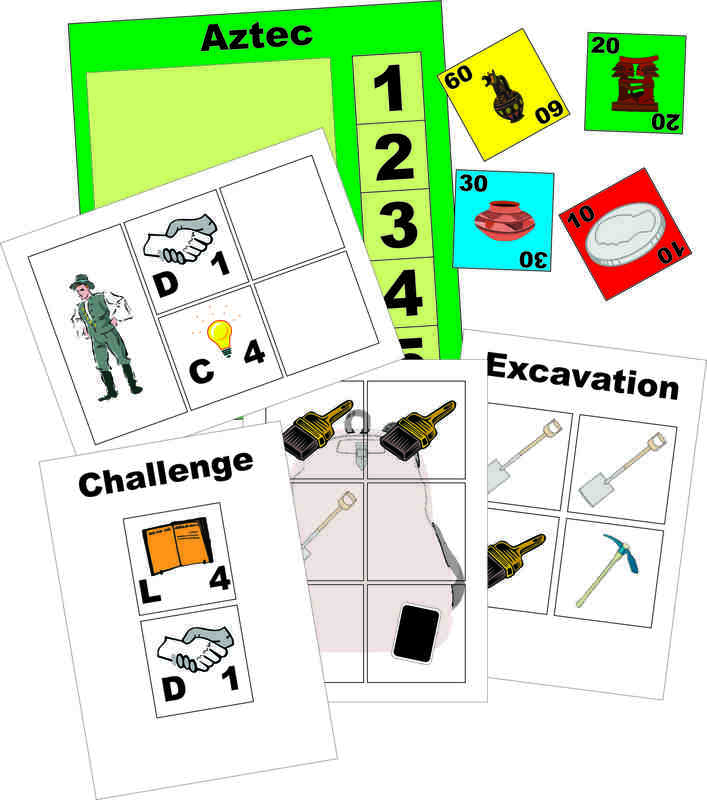 We had this one idea for a game about digging up artifacts around the world. We appropriately called it The Dig. In our head everything seemed perfect. We spent our time balancing the game and then proceeded to make cards using the computer and a lot of clip art. There were 32 pages of game that had to be printed and cut out! The prototype looked really good and when we played it we realised that it did not play at all like the game that was in our head. We had to go right back to the drawing board and nothing from our first prototype was useful at all. Lesson learned! Get that first prototype made as quickly as possible so you can test the concept before investing too much time making it look pretty. As with “The Dig”, we’ve made prototypes that end up getting shelved. 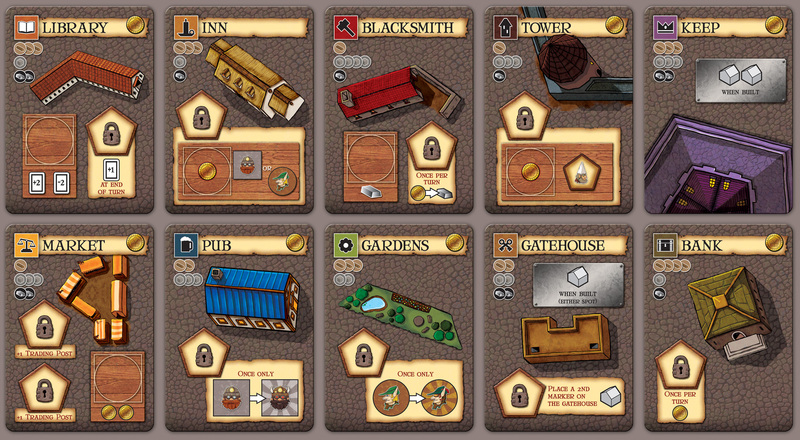 But some games, like “Belfort” have come from us making a very very very simple 24-card prototypes that we called “Pocket Games” (now “Games-on-the-Go” or GotG). This was an excellent idea Jay had – try to make a game with as few components as possible. We tried to make games in many genres (tile laying, resource management, area control, etc.) with a self-imposed limitation that it had to be played with a maximum of 24 cards. That, in itself, is a design challenge (and I might have just stole Jay’s thunder … whoops!). But what comes out of having such a quick prototype made is that we are one step closer from concept to reality. We gain a quicker idea of what works, what doesn’t, and what plays well enough to invest more time in. When your design partner is an 8-hour plane trip across the country, we need to know what our priorities are when we meet. Having these GotG prototypes lets us decide within a few hours if a concept is worth our while. And some, like “Belfort”, became instantly high priority after a few hours spent with 24 cards and some paperclips. Remember – everything has to start somewhere. There’s noting like actually holding cards in your hands, be they cut out of recipe cards or made out of old playing cards, printed on a colour laser or written on with a marker, to help you bring your game from the spark of an idea into something much more. Using one of your game ideas from Game Design Challenge in Step 5, make a quick prototype and playtest it to see if it plays like you intended. Don’t focus on art at all, just make sure it’s fairly balanced and go! Belfort Update – Title of game?